One of the greatest traits of leaders is not how much they talk, but how much they listen. “The hardest thing for me to do today is to talk about myself, because I’m in it for the kids. I listen to people. I guide them. I support them. 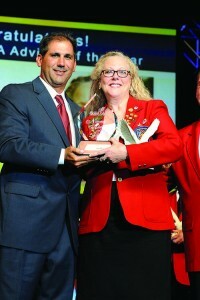 I don’t do a lot of talking — and especially about myself,” says SkillsUSA’s 2015 Advisor of the Year. Denise Foster has been a dental assisting instructor at Putnam Career and Technical School in Eleanor, W.Va., for 30 years. In that time, Foster has learned quite a few things about teaching. First, letting students know you have noticed them is extremely important. “It’s about building relationships,” she explains. 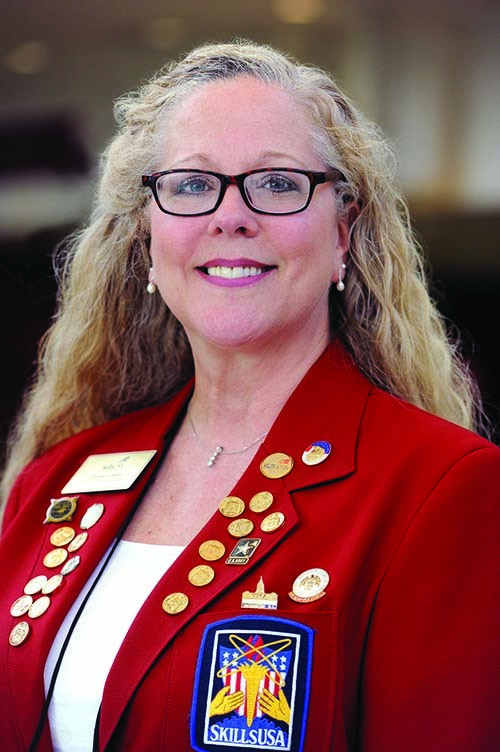 In 1976-78, Foster was herself a student in the same dental assisting program and served as president of her SkillsUSA chapter, then known as VICA. She completed the program, went to work for a local dentist and enjoyed instructing patients on routine dental care. When her former teacher retired, Foster jumped at the opportunity to interview for a position and was hired in 1986. Now it’s her final year of teaching. Foster will end her career in the place she started — where, as a student, she learned to develop X-rays, studied anatomy of the head and neck, and gained the confidence that can only come from a caring advisor. Today, her students travel from four different high schools to study in the same classroom. The SkillsUSA advisor says she would never have been involved with the student organization if not for a teacher who encouraged her to run for office. “At some point in everyone’s life, they need a person like Mrs. Foster: someone who wants you to succeed,” says her student, national gold medalist Kirsten Spangler. Above, Foster receives the national award from Clay Roccaforte of Air Products, which sponsors the Advisor of the Year program. Honored at the 2015 SkillsUSA conference, she is the first from her state to receive the Advisor of the Year award. “Maybe I am doing something a little bit special or above and beyond. [But] it is hard for me to think that, because I feel like I am doing what I am supposed to be doing,” Foster says. “I do everything that I can in my power to follow the standards that SkillsUSA puts out. Foster says SkillsUSA’s new Chapter Excellence Program helped change the dynamic at her technical center. It used to be all about chapter membership, she explains, and the school was not as focused on quality SkillsUSA programming. “It’s no longer just a few instructors doing everything for the school. Chapter Excellence is a way for students to enhance their portfolios when they finish school by being involved in community service, public relations and professional development,” she adds. Her chapter was one of 24 national Models of Excellence this year (see Page 10). 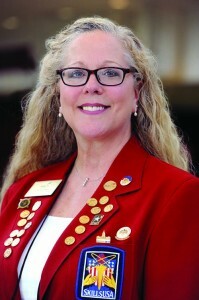 Foster isn’t just a SkillsUSA advisor with passion; she instructs a high-quality educational program, too. One of her students, Kirsten Spangler, was the gold medalist in dental assisting at the 2015 SkillsUSA Championships. Meanwhile, Foster’s Opening and Closing Ceremonies team came in fourth in the nation. Foster beams with pride as she talks about some of the community service projects her students carry out. Her “tooth fairies” march in parades wearing scrubs and pass out toothbrushes. The students teach elementary-school children how to properly brush and floss and about nutrition. They do drug and tobacco education as it relates to oral health. “My students are healthcare professionals, so we have that need to help other people, and community service falls right in line with the class,” Foster explains. Foster sums up her career this way: “When I started, I knew teeth. And I knew my heart for VICA. I knew what VICA had done for me, and that was a life-changer.